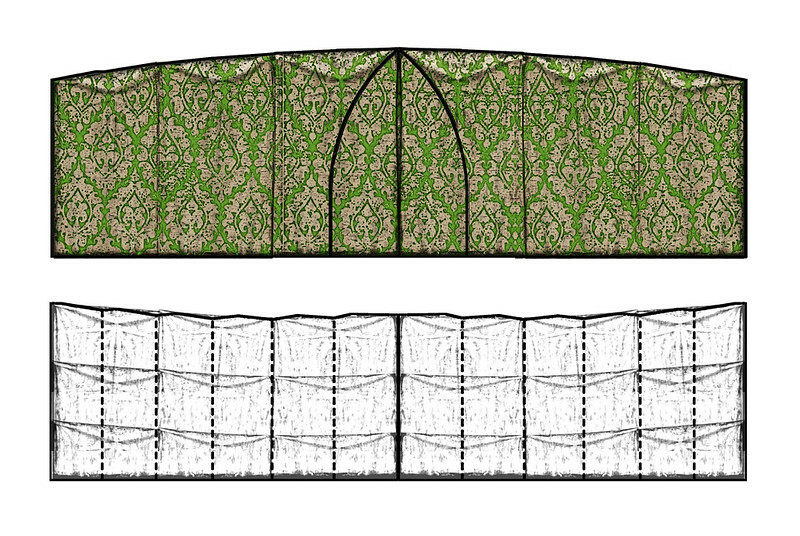 I think i've nailed down my Mongolian ger(yurt)/Bedouin tent hybrid I've been envisioning. it is more of an oval shape, with a roof that slopesmore towards the back, would be placed facing the prevailing winds. Walls would be a yew style copse, hollowed in the middle, or saplingswoven in an arched lattice, or the more ger like transportable lattice structur to start. The entrance could be placed on along either the long or short axis of the oval living area. 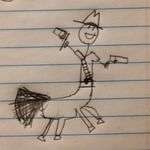 This I think is going to be the basis for my evolving elven architecture. Looks great so far. The "weaving" band connection is very interesting. Never thought of doing connections that way. I like your plan for the yurts! Worked a bit on unfolding geometries today. started with teh roof for the wide oval. I came to the idea that if I did different vertically stacked rings for the roof, the lowest edge could be made with differnt scalloped type edges, to give more light to the interior. 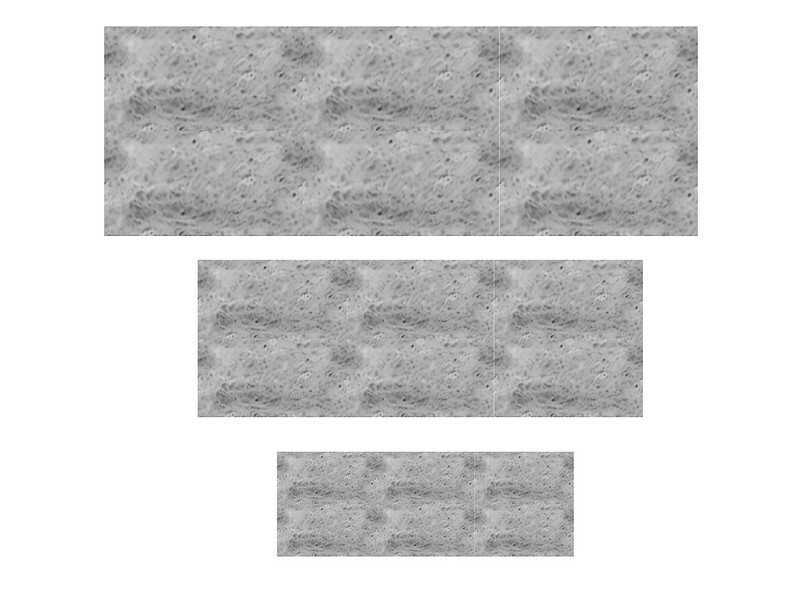 Been working out some textures, these were developed for seamless using the online tool I found. 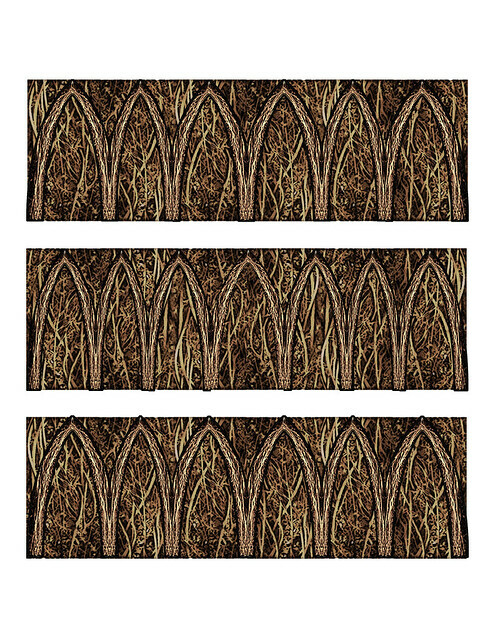 need some fine tuning to do, and these would be augmented by ivy/leaves/flowers/moss/lichen as well to add a bit of color/variety. Thinking of using the yew based texture to develop a stone carving texture, a simplified stone carving/ wood carving of the twisted saplings for more permanent structures. 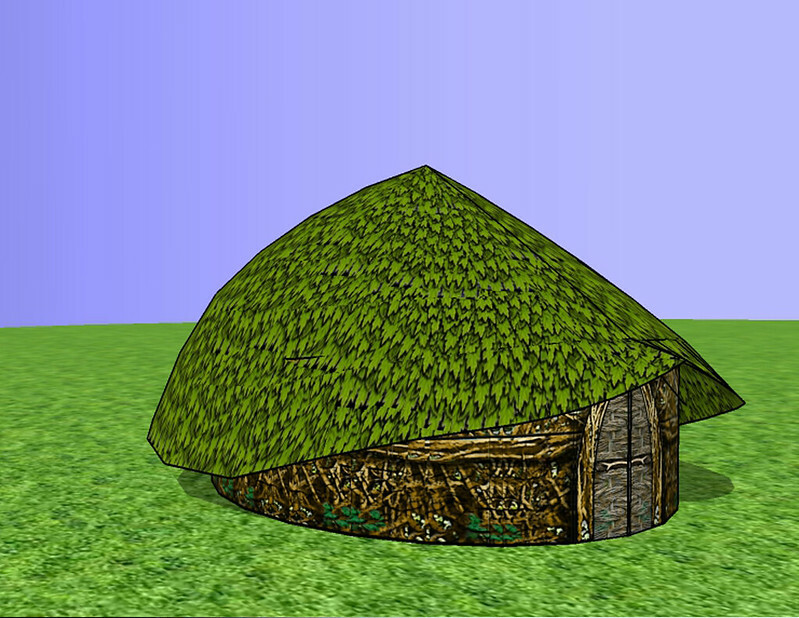 Texture tests on the Narrow Yurt , I've been thinking of 2.5D branches/leaves as options to have coming out at angles from the roof, also working on a roof texture inspired by tent caterpillars, where the elves would have them spin/weave a roof for a structure. I really like the woven sapling stuff. The patterns on the canvas might be a bit fine or busy, depending on scale. Following with interest. Working on a more difficult one, using Arctic fire Dogwood branches, having to crop out individual branches. 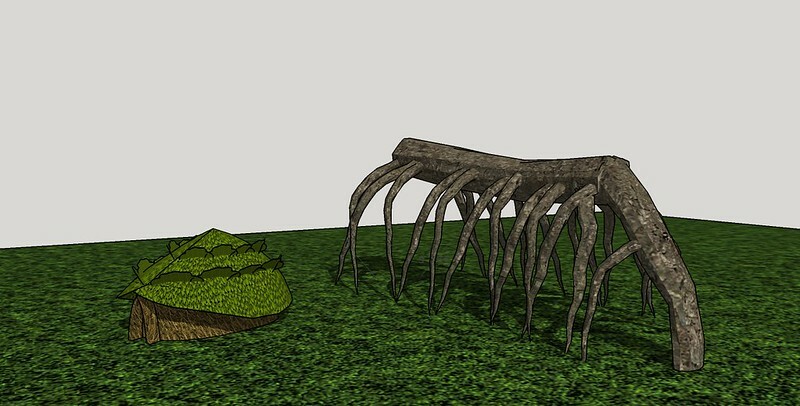 Did some work on the tent caterpillar texturing, this will work nice as a base and can be augmented with fallen leaves, etc. 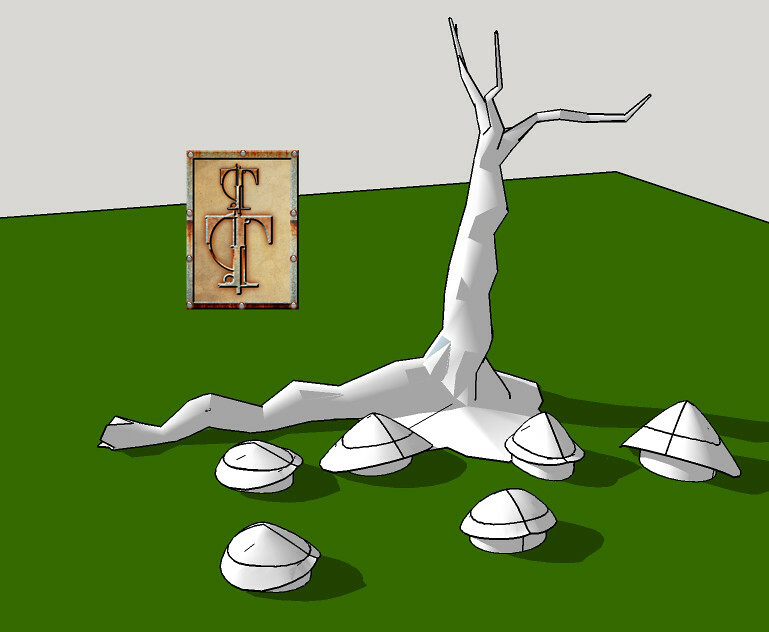 I've been working out some geometry variations and the concept of an Elven village centered on a Lord's or communal hall in a hollow tree or nurse log base, or a combination of those. Need to work on the development of the hall a bit more. 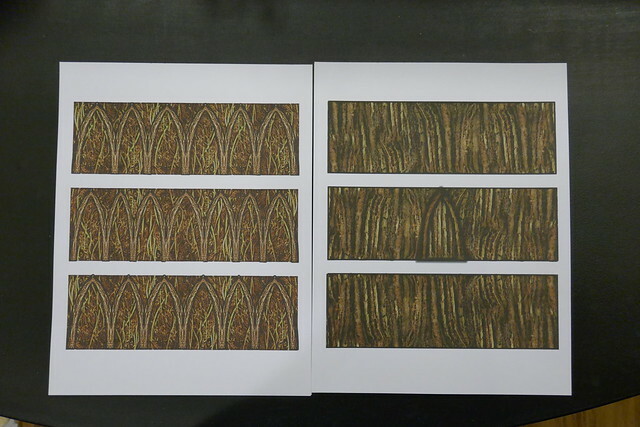 Going to work on some textures a bit, especially on the Arctic Fire Dogwood sapling structure, patterned canvas, and carved wood/stone textures for the permanent structures. 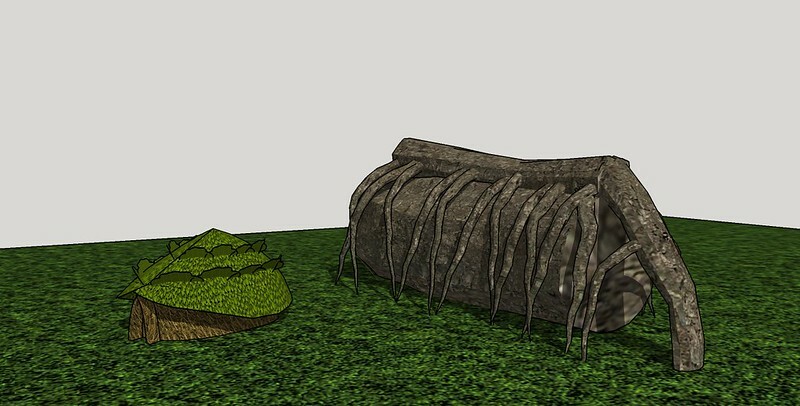 Managed to get started on the "Nurse Log" hall geometries..
Root structure without log: ( The sides could be filled with twisted saplings, fabric panels, or even carved wood, bark sections like an Iriquois long house, or stacked stone walls. Ok, have enough design elements to work on for buildings, with wide/narrow ovals, 2 slightly different roof geometries as a base, some archways/vestibule and porch/veranda ideas to start. 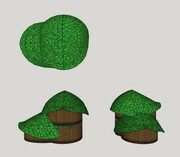 From simple nomadic yurts to semi=permanent branch/rock walls bases for "fabric" roofs to more permanent structures. Here's a rough sampling of 15 different designs on the same basic philosophy. 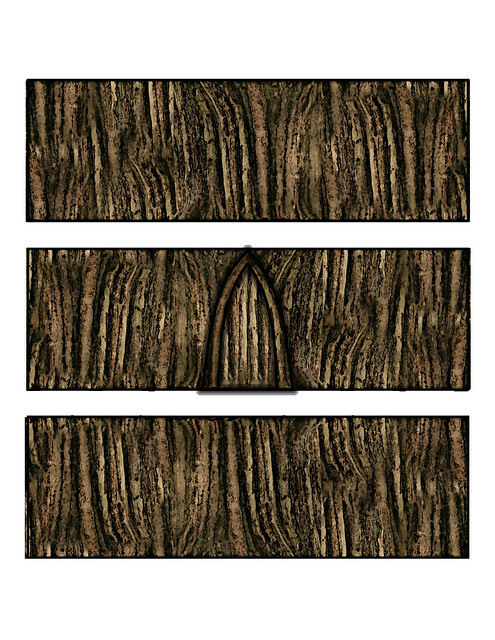 I have also been working on different branch/bark.stone/fabric walls and roofs, going to start doing layout texturing on some of this,while I work on branch texturing and tree designs. I've been working on Flattening out some of the designs, and texture development. 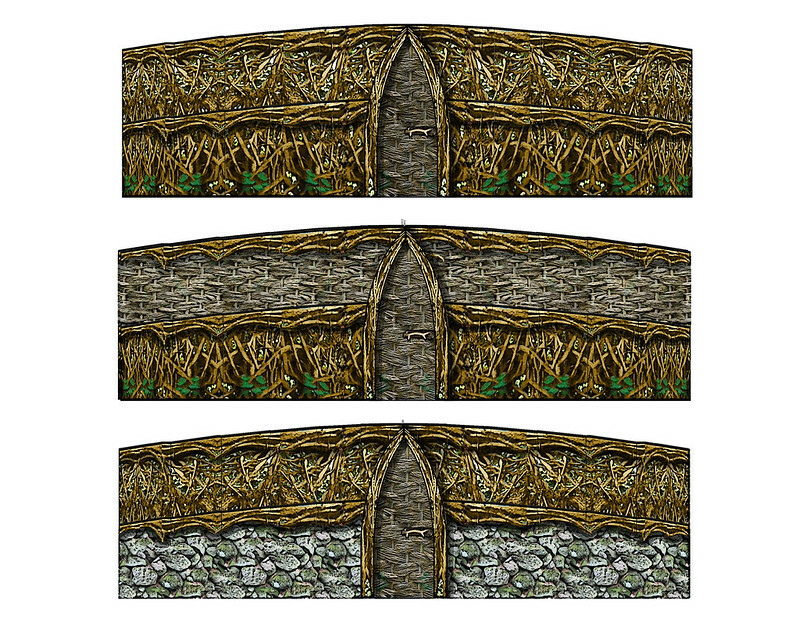 Here is some of the work on Branch textured wall, with woven sapling screens, and possibly growing on top of a stone wall. 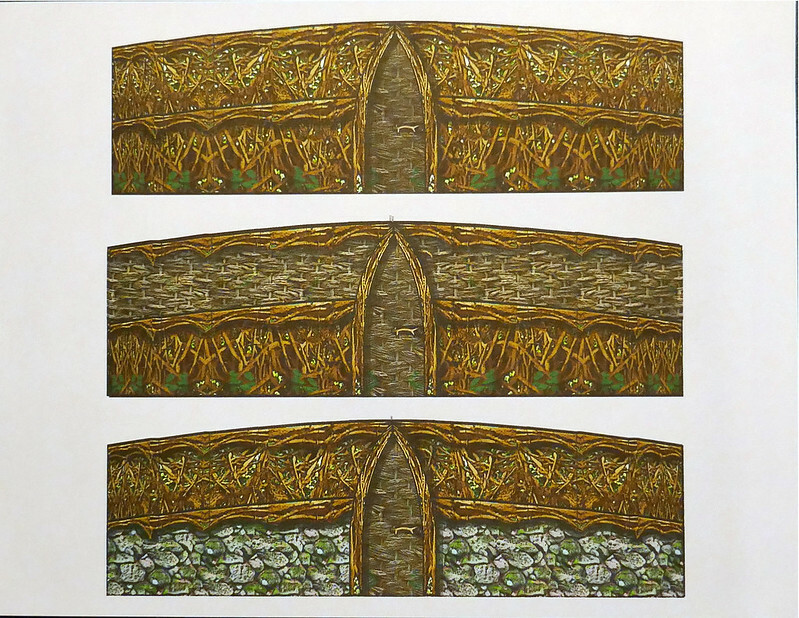 An interesting adjunct to this would be some scenery using the same - or similar - "woven" textures, essentially heavy-duty plant and bramble hedges/fences with the properties of defensive walls. A little like the archetypal fairy-tale thorn or rose hedge that prevents anyone from passing. Anyone who's ever tried getting through an old, overgrown wood with actual bramble patches knows how effective they can be like this, certainly! 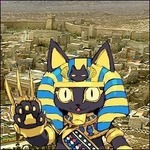 "placemarkers" you might say, of locations they have been, and might return to. 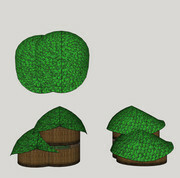 Been working on texture development a ,lot lately, and simplifying the Nurse Log Elven Hall concept. 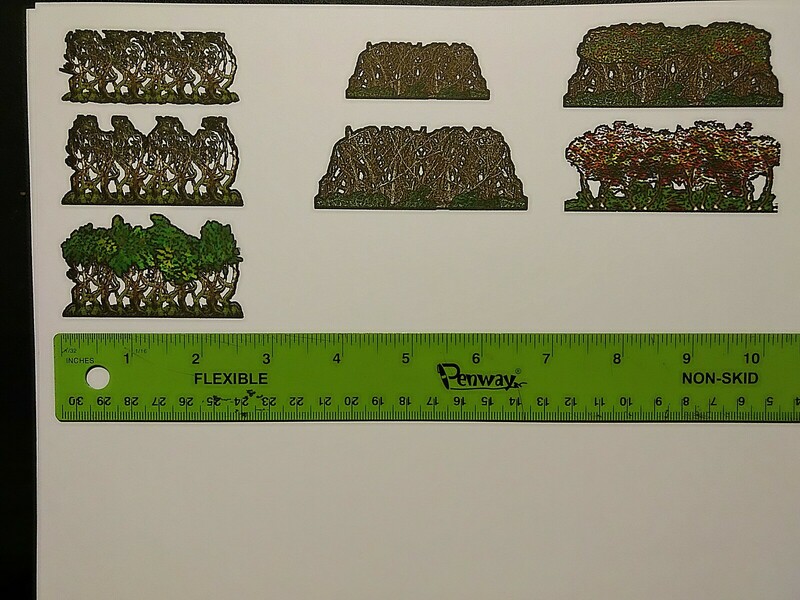 Barriers and bushes look great, any chance 1 will end up in the hoard? 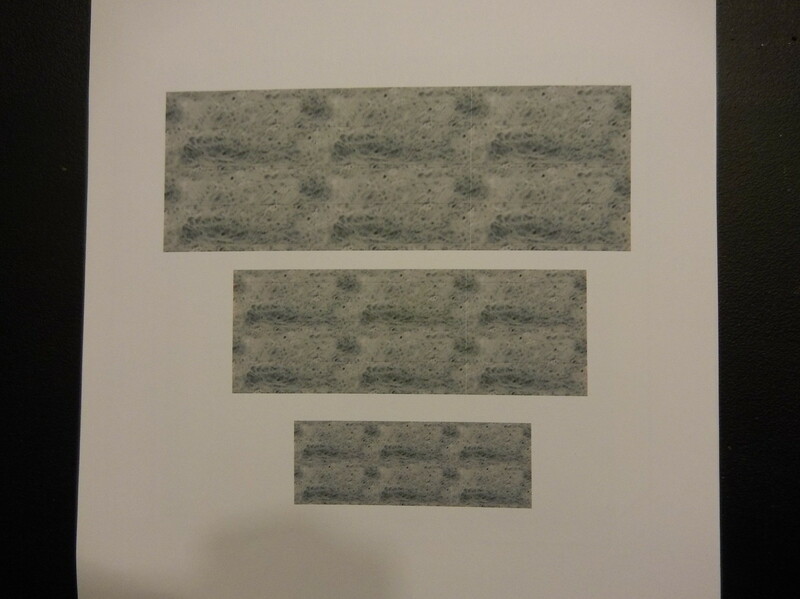 Going to try to get some layout as crosspiece 2.5D layout done by Wednesday/Thursday to get some in the Hoard! They aren't exactly "Dungeon" props, but figure they will work in quite well. Looking forward to seeing all this lovely stuff in print! Please tell us that all of this will be available, your textures are A1 awesome! The texturing is awesome. This is a challenging model you are trying and it looks great. How would you like some stuff from my Champions campaign? Wow! Once my wife sees this, I don't think it will be hard to convince her that this is a must have for my collection. Face piles of trials with smiles, it riles them to believe that you perceive the webs they weave. how is this coming Tom? really looking forward to it! the big tree looks great! 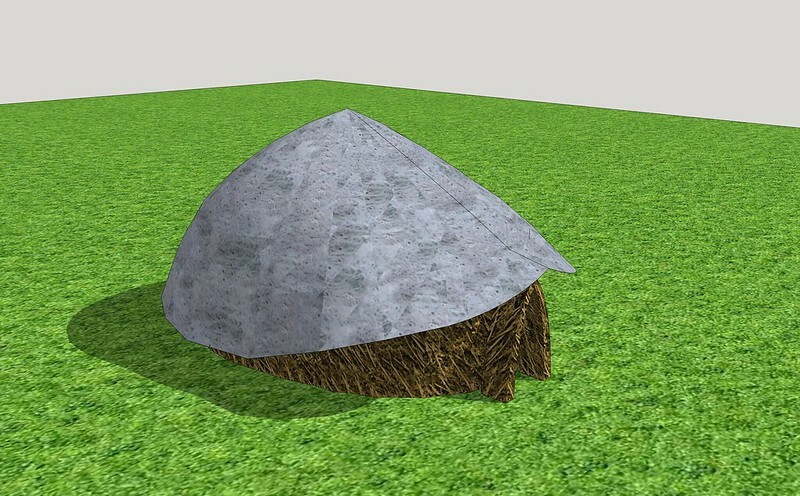 Got sidetracked for a bit working on textures that weren't quite as busy or blurred at scale and printed, and working on developing expansion of the yurt inspired design into larger and multi story structures. It hasn't been that easy developing my fictional design history/philosophy for elves that would be consistent with differing geographical and climatic but I think i am making progress. I've also been working on simplifying the geometries a bit, as well as working on textures covering fabric walls, natural (living) structures, processed wood and stone. I've also been developing a workflow that performs more of the layout ( including unwrapping/ adding tabs/ page layout) using Sketchup to reduce the number of different programs I use to work with the images/designs. 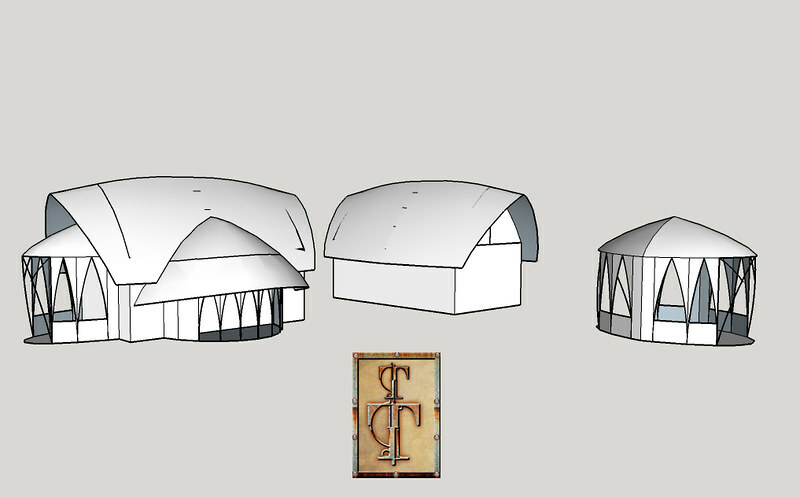 Here are some concepts for more complex buildings based on the initial yurt inspired design. 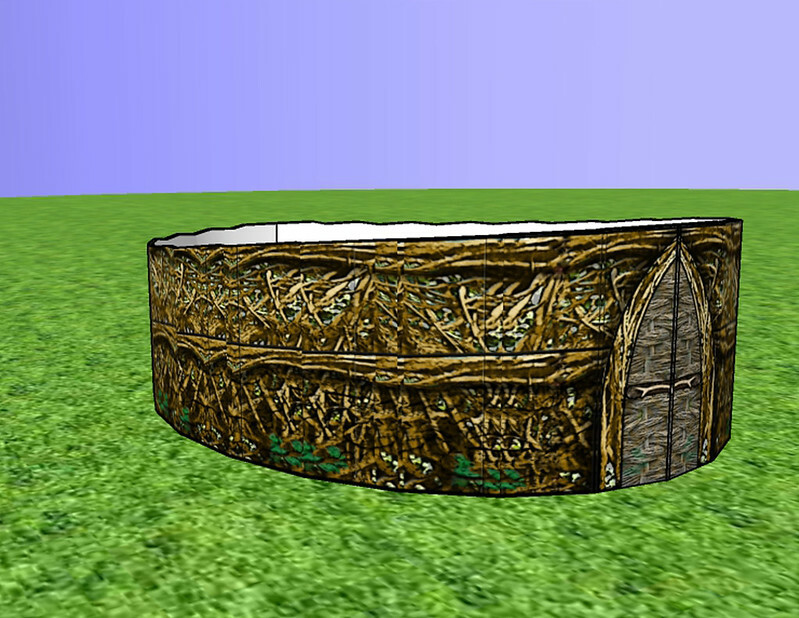 Here are some test-builds of the basic Narrow front and Wide front Eleven Yurt inspired Dwellings. I like these, it looks like the walls of the yurt are peeking out from under the eves.